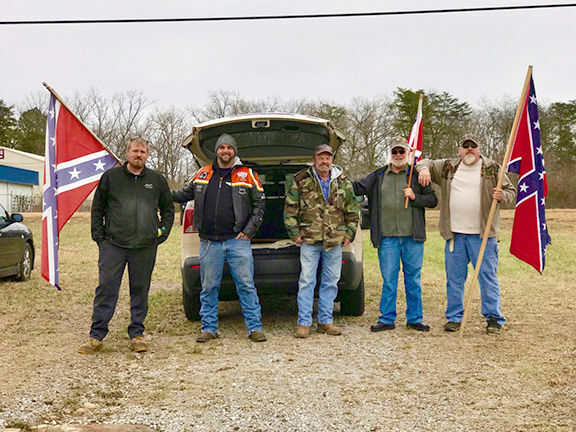 CROSSVILLE, Tenn. — The Sons of Confederate Veterans celebrated the fifth annual Confederate Flag Day March 2, which is in the SCV Standing Orders as March 4. Last year was a huge success. They strive to make it bigger and better each year. Pictured from left are Chris Keagle, Brent Webb, Roy Blalock and Clarence Farmer. Not pictured is James Lovelace. The logic behind this date is that March 4, 1861, is when First National Flag (Stars and Bars) was hoisted over the Confederate capitol in Montgomery, AL, and on March 4, 1865, President Jefferson Davis signed a bill into law creating the Third National Flag. Every division and every camp without a division sponsored a Flag Day observance somewhere within their state. Within the Highland Brigade, they chose to hold a flag rally in each town that holds a camp. Here, in Crossville, the Sgt. William A Hamby Camp #1750 held its rally on North Main St. Many other camps selected to hold theirs in the town center, and a few chose to flag on an overpass. The local camp had seven to eight men who spent about three hours just holding up the Confederate Battle Flag to honor those men who fought and died for the south during the War Between the States. The purpose was to honor ancestors and to let the fine folks of Crossville know they were there. They had many folks come by and honk horns, wave and give thumbs up to them. They saw no signs of disapproval from anyone. Many folks say that the battle flags stand for a racist group. The men of the Sons of Confederate Veterans are not part of these hate groups nor do they want to be part of them. For the men of the SCV, they are about the heritage of their ancestors who were men of honor. They invite anyone, no matter their race, to come and visit their camp meetings. They meet each month on the third Thursday of each month at 6 p.m. in the basement of First Christian Church. The church is located on the corner of First St. and Webb Ave. They share the true history of the South, and they honor those men who served. For more information, contact Charles Ervin, camp commander, at 287-3325 or southronman48@hotmail.com or James Lovelace, adjutant, at 865-548-5487 or Fleetguy102@gmail.com.